NEW YORK, NY – June 1, 2017 – Pack your passport and grab a chainsaw, because SHARKNADO is going global! 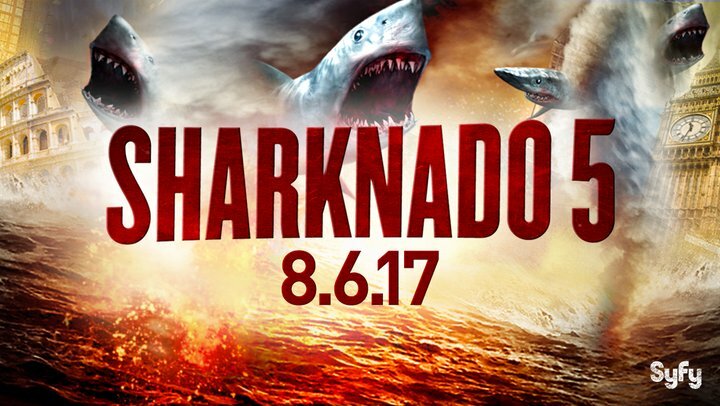 Taking the world – and unsuspecting celebrities – by storm, the movie event of the century blows into town this summer, and today, SYFY and The Asylum revealed its chilling title:SHARKNADO 5: GLOBAL SWARMING. The latest installment in the hit pop culture franchise premieres on SYFY Sunday, August 6 at 8/7c and will air in more than 100 countries. SHARKNADO 5: GLOBAL SWARMING and the film’s official tagline, “Make America Bait Again!,” are the result of a fan-sourced social initiative launched this April. Calling on fans for inspiration, SYFY invited Facebook users to submit their most creative and outrageous ideas via an interactive bot.